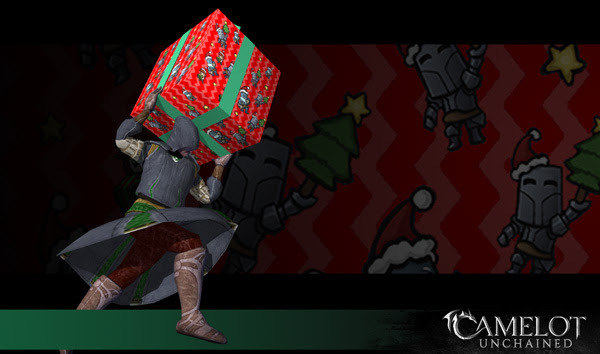 First, Happy Holidays, Merry Christmas, and a most happy new year to all of our Backers and their families and friends, as well as anybody else who is reading this message! Second, as our last-minute flurry of opening and closing tests has shown, we’ve been busy big elves at the end of the year. Today ended the first major step in our delivering the Saturday Night Sieges you hope and expect to see from us, which was to get a siege running with destructible buildings, multiple siege weapon types, sapper-type bombs, NPCs, and players. And well, we accomplished exactly what we set out to do! Trebuchets, scorpions, and bombs (better than lions and tigers and bears!) were damaging, blowing up, and ultimately destroying buildings in real-time with a server-based physics and stability system. There were hiccups, of course, and some giant pieces of rubble acted more like a Tesla rocket in how high they flew, but it was fun and proved that our engine could already handle the load. At the end of this update, I have included a screenshot of more than a dozen trebuchets, and an equal number of scorpions, in one small part of the battlefield, knocking down a building. It was a lot of fun, and it lays the groundwork for what I know will be one of the deepest and most interesting siege systems in any MMORPG. Bold words, I know, but I have no doubt we will be able to do that. You’ll get to take these first steps with us this Sunday, and then continue walking down the path once we get back from break on January 2nd. It’s going to be a lot of fun and when you see the presentation that Ben and I will do in January. I think you’ll be even happier you backed and stuck with us over this long and very winding road. If you missed this week’s livestream with Andrew and I, you can find that HERE. Siege Scenario: This week, much of the team focused on the first iteration of a siege scenario for Backers to play in next year. We’ve been having a lot of fun testing this internally. We may have also added a bit of a Christmas theme to a few of the new items! As of this writing we have our first Backers in to test with us! We look forward to more testing and further improvements next year! Tech/Art – Siege Scenario Bomb: Christina added functionality for a bomb that players can gather and then deploy, on a timer. This currently creates quite a hole in the wall of a castle! Dionne created a large Xmas-themed gift box as the bomb, with FX provided by Mike and dB. Scott added a last-minute animation so your characters run with it carried overhead. It’s quite hilarious! Tech/Art – Generic Trebuchet for Testing: We added some simple functionality to deploy and aim this monstrosity. Joe took our old, generic trebuchet, and added some simple firing animation to it for testing. This has been quite fun to use! 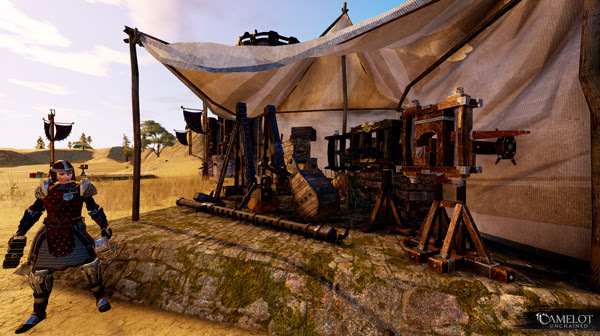 Dionne created a siege engine resource tent (also just for testing), allowing players to grab a scorpion or trebuchet when needed. I mean, when do you not need one? Art – Builder’s Brigade – New Castle Blueprints: Big thanks go out to the Backer Arrobee for a quick turnaround on a set of blueprints, allowing us to build a new castle in our test scenario! It even has a few large towers at its corner to further test rubble! Also, I have to say it’s just plain cool to knock those down! 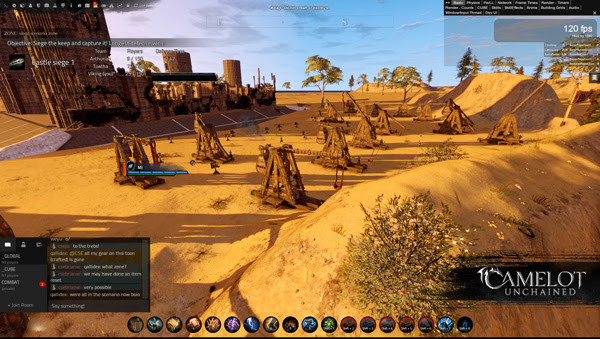 Tech/Design – Siege Scenario: Several people worked on additions to the scenario system, allowing players to take turns defending the castle while two outside Realms besieged it. This also included support for UI elements like the scoreboard, scenario queue, and capture bars. Scenario item loadout rules were also updated to allow players to get siege engines during this scenario. Tech – Entity Resources: Anthony landed this work, allowing AJ to display resources in the UI. This is part of making the ability system easier to work with, and supports the incoming ability editor. WIP – Building Server Improvements: This week, Colin focused on the building server threading, which will let the server operate on multiple buildings simultaneously. Tech – Animation – Bow and Scorpion Animation: We fixed the bone aiming so that players animate when aiming. As mentioned previously, this helps inform improvements to how siege animation aiming will work with the scorpions. Speaking of which, players now use their side stepping and idle animations with the scorpion. Next will be hooking up the aiming with the character. Art – Characters 2.0: Better-looking and more performant characters! Much of this work is wrapped up, and we will begin putting this, and the animation work below, into the game at the start of next year! Valkyrie Materials: Jon completed an update of each. Generic Human Undergarments: Jon completed male and female, all Realms. Physician’s Belt: Updated UVs and materials. Luchorpán Armor: We’re almost finished fitting these to the female. Equipment Import and Setup: Sandra and Scott finished editing all the currently weighted armors into the editor. This process sets up all the various equipment pieces you can equip in the game. 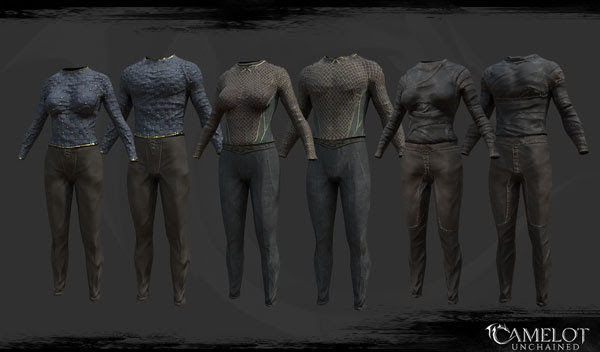 Weighting Human Females: Joe updated the female Arthurian and Viking armors, and is finishing up Vikings. 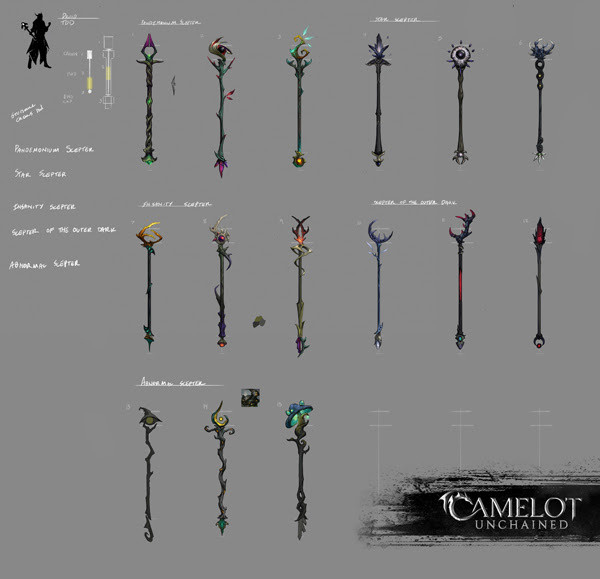 Art – Concept: Michelle completed another round of scepters for our mages, refining them further. Jon is excited to get started modeling these as soon as possible! A pretty good list for the week’s highlights! 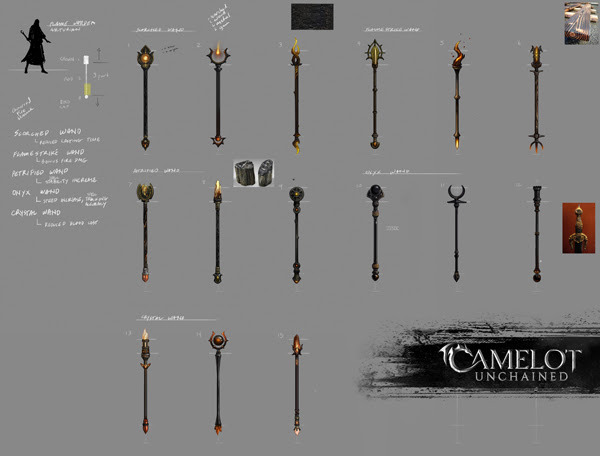 For art this week, we start with a compilation of all the wands and scepters Michelle has been working on for our mages. There were a lot of favorites upon review! Jon updated the shirt and pants undergarments as part of our Characters 2.0 update. The following are a few images of the assets created for the siege scenario. First up, Scott created a quick carrying animation for our “bomb,” provided by Dionne. 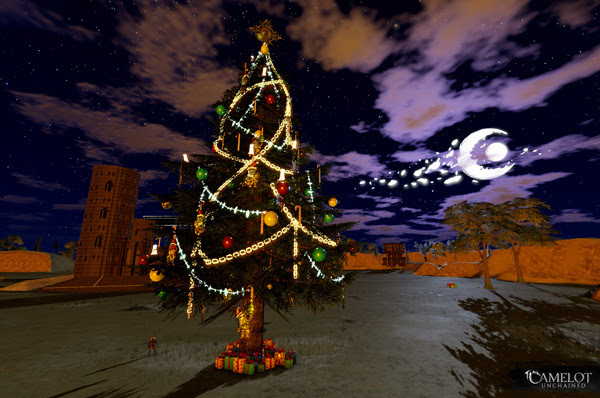 Dionne created both a Christmas tree and siege resource tent for the siege scenario, as well. Hey, before we close out this update, let me direct you toward our EPIC newsletter for December that closes out the year! It contains a massive presentation on The Depths board game that many of you have noticed we have been making with Max as lead designer, and which has been coming together quite nicely. 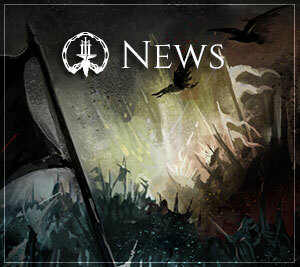 The newsletter also contains a State of the Game piece from me, with even more information and updates than are contained here! Again, thank you so very, very much for everything!